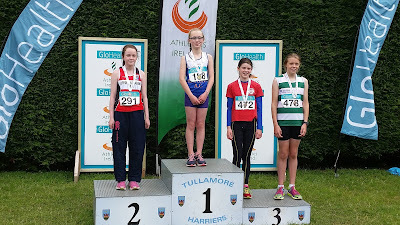 Laura Kelly, Cara O Sullivan and Sophie Quinn impressed in their respective events at yesterdays Leinster juvenile championships. Laura put her recent injury woes behind her when she won the u 13 high jump Leinster title with a wonderful PB of 1.46m . Cara O Sullivan was equally impressive as she claimed the u 12 high jump title with a 1.31m clearance. Sophie Quinn dominated the girls u 13 600m right from the gun and made running 1 min 41.46 sec for the distance look easy. In this kind of form, these girls should be serious contenders for national titles in early July. Eoin Kane was an excellent 5th in the boys u 13 600m in 1 min 44 sec. He is a tough competitor with real potential and continues to make steady progress year on year. James Kelly and Fionn Heffernan were 3rd in the u 11 pairs 600m, Gavin Witter and Fionn were 3rd in the pairs long jump while Aisling Shelvin and Olivia Ryan were also 3rd in the u 9 pairs long jump. Niamh Murphy was an excellent 6th in the u 12 high jump and 60m.